Personal trainer and bar-athlete extraordinaire, Al Kavadlo believes you don’t need a gym membership or any fancy equipment to get in the best shape of your life. All you need to build a strong, muscular upper body is a simple pull-up bar. 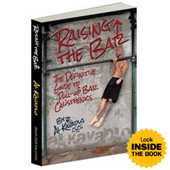 In Raising the Bar: The Definitive Guide to Pull-up Bar Calisthenics, Kavadlo breaks down every type of exercise you can do with a pull-up bar. From the basic two arm hang, to the mighty muscle-up, all the way to the elusive one arm pull-up, the “bar master” takes you step by expert step through everything you need to do to build the chiseled frame you’ve always wanted. Whether you’re a die-hard calisthenics enthusiast or just looking to get in the best shape of your life, Raising the Bar will meet all your expectations—and then some! 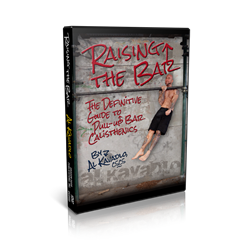 How sure are we that Raising the Bar (DVD) will work for you? 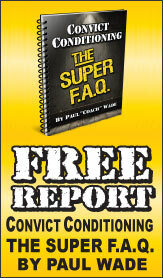 Simply fill out the form below and put Raising the Bar (DVD) to work for you right now. Obviously, we would go out of business if Raising the Bar (DVD) didn't work, the way we said, right? With the promise of a full refund if you're unsatisfied, you have nothing to lose by trying Raising the Bar (DVD). Go ahead and try it today. Cast in the "concrete jungle" of urban scaffolding and graffiti-laden, blasted walls—and sourced from iconic bar-athlete destinations like Tompkins Square Park, NYC—Raising the Bar rewards you with an inspiring new vision of what the human body can achieve. •	Stride down the mean streets with a whole new swagger—your etched set of washboard abs, your righteous pecs, your gnarling forearms and your whipcord frame broadcasting a newfound strength and an animal vitality. 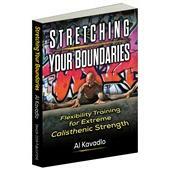 Be inspired by the ultimate vision of human performance you’ll see in the playful yet detail-packed instructional sequences—but as Al Kavadlo would be the first to recommend, find a strong band of training brothers and a solid training mentor if you are intent on attaining the greatest of feats that lie before you in Raising the Bar. Well put indeed, Al! Al’s pull-up program is NOT for shirkers or wannabes. If you’re ready to get to serious work and ready to grab your bar, then be our guest. Many females have an almost visceral fear of the pull-up. Al confronts this fear and the associated myths that drive that fear. Women, if you’ve been scared/on the fence about engaging with pull-ups, here is all you need to inspire you into pull-up action. Now say hello to the monstrous full-body killer, The Korean Dip—don’t say you weren’t warned! From the L-Hold to the incredible V-Hold—do if you dare! As promised, there’s a whole wide world of fun and challenge lurking within the one Big Move that is the Pull-up in all its greatness. You may not have ever wished to BE a monkey, but you gotta feel humbled when you watch a chimp bounding around in the branches. You have to envy the amazing tensile strength and the power-acrobatics that the chimp can pull off with a nonchalant shrug of the shoulders. With its unique demand for both pulling and pushing power, the Muscle-up can single-handedly build serious strength and sculpt a powerful upper body—and it does a serious number on your abs while you’re not looking. According to Al, then—and who am I to argue?—"the Muscle-up is truly the ultimate upper body exercise." The High Angle Back Lever: check out the musculature you could achieve with this evil move! Gandhi said: "Strength does not come from physical capacity. It comes from an indomitable will". Now this I love—and never was truer word spoken than when confronting the one-in-10,000 or some say the one-in-100,00 achievement of the One-arm Pull-up. One-arm Hangs—the next step on the road to One-arm Pull-up glory! Al's dvd is simply amazing! 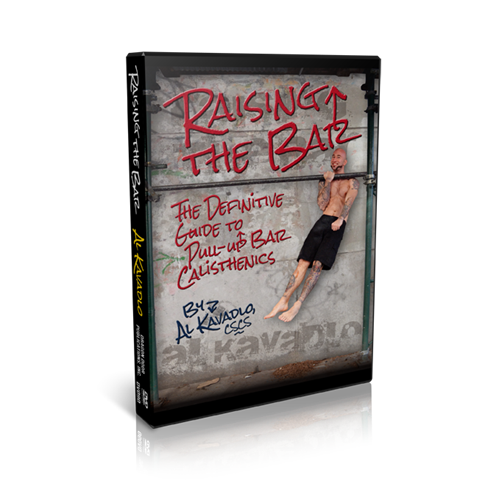 This dvd is a must have for anybody who is serious about bar calisthenics. Als instruction helped me acheive my first muscle up, and has since helped me clean up my form. I cannot recommend this dvd enough, buy it now! Rated 10/10 Playful, inspiring and hard! This is a review of the digital video version. It is an excellent production, complete regarding the bar calisthenics repertoire. Al and Danny make you really feel at ease and it is like having a one on one session with the two artists. Everything is explained clearly and demonstrated flawlessly. Mind you there are many extremely advanced exercises in this video. It will keep you coming back for years as you develop your abilities. It is refreshing to watch Al always smiling and Danny always serious and strict. This video is highly recommended. The only drawback tnat I see is that it leaves you wondering why DragonDoor hasn't already produced a video version of Pushing the Limits and Stretching your Boundaries? just an enjoyable frickin' dvd. awesome. really. get it for yourself; get it for anyone you know getting into movement. it will be a regular reference and inspiration. Al's DVD is a must have if you want to be in the best shape of your life just using your own body weight . The best for me is the step by step informative progressions on all exercises. With just a few weeks under my belt I am truly stronger and leaner. Buy this one to get inspired and fine tune your technic. 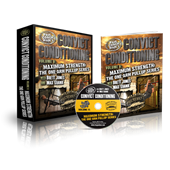 I also bought C. Conditioning Pullups dvd. I need both. The latter cover a program with reps and sets. It has functional point of view. The first one is more playfull. After watching Al, I get in the mood of a kid. I'm 45 years old and doing my first "skinning the cat" in 35 years or ever along with the kids in the playground. Note the differences between Raising t.B. and C.C. about "neutral elbows". Rated 10/10 Raising the Bar: Above and Beyond! I participated in the first ever PCC it only made my thirst for knowledge and achievement greater. Al and Danny were so impressive in person, that I felt compelled to buy the DVD. I was not disappointed! The DVD was not only chock full of great drills and progressions for bar work, but it was presented in a extremely fun and entertaining fashion. This "no frills" instructional bar training tutorial is a must for any serious about Bodyweight Training. 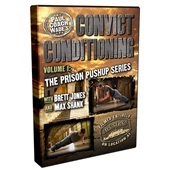 I got this DVD because I wanted to learn more about calisthenics and this DVD is amazing! It covers pull-ups, dips, muscle ups, ab training a ton of more great stuff. The music on the DVD is great and very enjoyable to watch. I really like the chemistry between Al and Danny on the DVD. Their different approaches and personalities really make this DVD amazing and I would highly recommend this to anyone who wants to learn more about calisthenics. This is a great DVD. 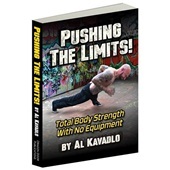 I first found Al Kavadlo when I was looking for a video of perfect push ups for my 9 year old-turns out there was a lot for me too! What I like about this DVD is that it teaches you how to work up to these moves. Al makes things look easy, but he'll tell you when something is advanced & he breaks it down: Where to start if you've never done something, how to add difficulty, what you need to master to move up. How to modify something if you have an injury. Al is accessible & has a positive, enjoyable approach to strength training. I recommend this DVD.